Jeffrey Welch's Blog: Can You Use Human OTC Eye Drops as Eye Drops for Dogs? One morning last summer, I spotted a troubling green discharge in the corner of my dog, Baby’s, right eye. I spend the best part of each day thinking, researching and writing about other dog owners’ canine health and behavior questions. Weirdly, this means I often take my own dog’s hardiness and well-being for granted. For several heartbeats, I experienced the same mixture of indecision and panic that I imagine drives most dog owners straight to use their own human eye drops as eye drops for dogs. I’ve written enough about dog eyes to recognize the verdant hue of the sludge accumulating in Baby’s eye should be a source of concern. I didn’t know what the problem was, but I marched instinctively to see what over-the-counter eye wash I might have to try and deal with it. Should I reach for Visine or whatever human eye wash or ointment I might have ready at hand? 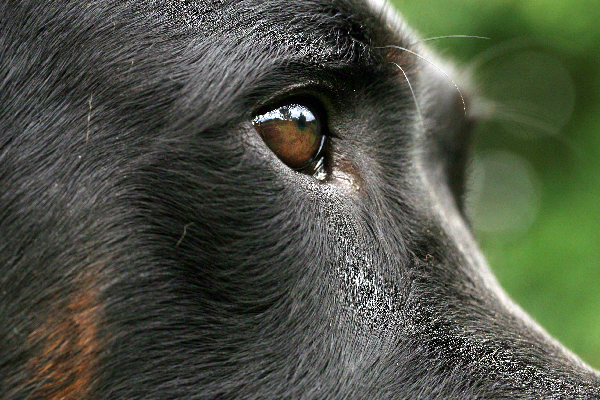 Can human eye drops be used as eye drops for dogs? Can you use human OTC eye drops as eye drops for dogs? Photography ©fotokate | iStock / Getty Images Plus. If you’re reading this, then we’ve both remembered that Google can be our friend and ally. Reading through a number of trustworthy sites, I began to see the same solution: a simple, no-frills, saline solution that is applied with nothing more complex than cotton balls. Over the course of a few days, Baby’s right eye cleared up, and the sleep that accumulated in the corners of her eyes took on their customary white coloration. There was no need for medicated eye drops. Minor dog eye infections can arise from any number of causes. My dog doesn’t have long hair on her head, and there was no prolapse of the eyelid, so I could rule out hair as a potential irritants as well as cherry eye. It was a hot and dry summer, and there was plenty of loose sand at the park when we hiked. Any kind of foreign body, down to a stray piece of dust blowing into her eye and getting caught there, might’ve led her eyes to produce green discharge. Couldn’t you just use your basic human over-the-counter eye drops as eye drops for dogs? The active ingredient in Visine is Tetrahydozoline hydrochloride, which narrows the eye’s blood vessels. If your object is to dislodge a bit of mobile debris from your dog’s eye, drugs of any kind are not called for. Use human eye treatments only if and when you get veterinary approval. If you have half an hour or so, you can even make your own saline eye wash for a true home remedy! Baby’s eyes are always a little red or pink when she first wakens from a long nap or first thing in the morning, so it’s not usually a reason to get anxious. The most common form of pink eye in dogs is serous conjunctivitis, also called “dry eye.” Similar to the kind of eye infection described above — and frequently a cause of it— is an environmental irritant that prevents a dog’s eye from producing the tears needed to flush it out naturally. There was no swelling or inflammation in Baby’s eye, and the greenish goo was inconsistent with pink eye. You might be tempted, as I was, to grab your own over-the-counter eye drops out of instinct or force of habit. According to Dr. Kathryn Primm, however, “you will have done nothing to address the reason” for the dog’s ocular discomfort. Basic saline solution and cotton balls, the kinds you can get for about $4 to $5 total at your nearest drug store, constitute a safe and reliable preliminary approach. If the symptoms persist, the discharge takes on the look or scent of pus, and you notice your dog pawing at their face frequently, seek a vet’s advice before turning to medicated eye washes or ointments. As Dogster’s own resident veterinarian, Dr. Eric Barchas has written, “allergies are not a terribly common cause of eye problems in dogs.” Nonetheless, they can occur, and, like my own dog’s eye health issue, tend to be most frequent in the summer months. Like the two conditions we’ve described above, inflammation, redness and watery discharge in one or both of a dog’s eyes might be the result of an environmental allergen or irritant. Dr. Barchas also notes that the vast majority of canine allergies are, in the first place, caused by fleas, and, in the second, manifest themselves in irritated skin and relentless scratching. Have you started using a different kind of cleaner in the house? Just switch to a scented cat litter in a room where your dog also spends time? Did you just give your dog a bath using a new shampoo? For dogs dealing with a newly arisen eye problem, try to rule out external causes before potentially causing the dog extra difficulties with medicated eye drops or washes. The bottom line: Don’t use your eye drops as eye drops for dogs and consult a vet with questions! After three years of writing about dog health issues, I’ve learned two essential things that every dog owner should internalize at the earliest opportunity: Take a moment every day to really look at your dog. During one stretch, I did so many pieces on dog digestive problems, that I made a habit of watching Baby poop as a barometer of her overall health. It wasn’t until I noticed the warning signs of a possible eye infection that I started doing a quick check on her ocular health every morning, too. The second: Human medications, even “baby” or “child” varieties of popular, name-brand, over-the-counter formulas, can do more harm than good to our dogs. For any minor health issue lasting two days or fewer, there is almost always a simpler, non-medicinal solution that dog owners can turn to. If there’s a longer-term problem your dog is dealing with, or one you fear is developing, your dog’s vet will be glad to suggest the proper eye drops for dogs or eye medications for dogs — ointments, wipes, antibiotics or whatever is prudent— and their proper usage, or direct you to a canine ophthalmologist! The post Can You Use Human OTC Eye Drops as Eye Drops for Dogs? appeared first on Dogster.